Oldest Acacia Master Mason - Tom Bradley - 96 Years Old! We had an amazing time meeting Brother Tom Bradley today for his 96th birthday! (That's right 96 years old, and still sharp as a tack!) We discussed many amazing things about him to include his military experience, his work on telecommunications equipment like antenna engineering and the things he did for the International Space Station and Space Shuttle. He said he really appreciated us coming out to visit him and present him with a new Masonic Apron as well as provide him a quick refresher on the grips and words we leverage as our way of recognition. What a wonderfully delightful man he is! It is good to have brothers in this world like him. Each of us grew in his light as much as he appreciated ours. Happy Birthday Brother! A huge THANKS to Brother Jamie for coordinating this outing! Live DJ, bounce house, live raffles of generators, beach cruisers, mountain bikes and more! Come for the Best BBQ in town! ​Don't forget, the winner of the 1st annual Acacia XLII F&AM Henry Masonic Rifle Raffle will be announced at the BBQ. It's going to be a great time for the whole family! Please be sure to visit our Facebook Event and let us know you are attending. Or just stop by... we will be happy to see you! The Acacia XLII F&AM Gun Raffle! Get your raffle tickets for the gun raffle today! Important: Raffle winners must reside in the United States, Drawing will take place on November 7, 2017 & all winners will be announced on the Acacia XLII F&AM Facebook page. It’s very important that all participants READ THE DISCLAIMER before purchasing a ticket. By purchasing a ticket you agree to all regulations disclosed in the disclaimer. This raffle/promotion is in no way sponsored, endorsed or administered by, or associated with, Facebook. By participating in the Acacia XLII F&AM Raffle and purchasing raffle tickets each entrant or participant hereby releases Facebook of all associations with the promotion. 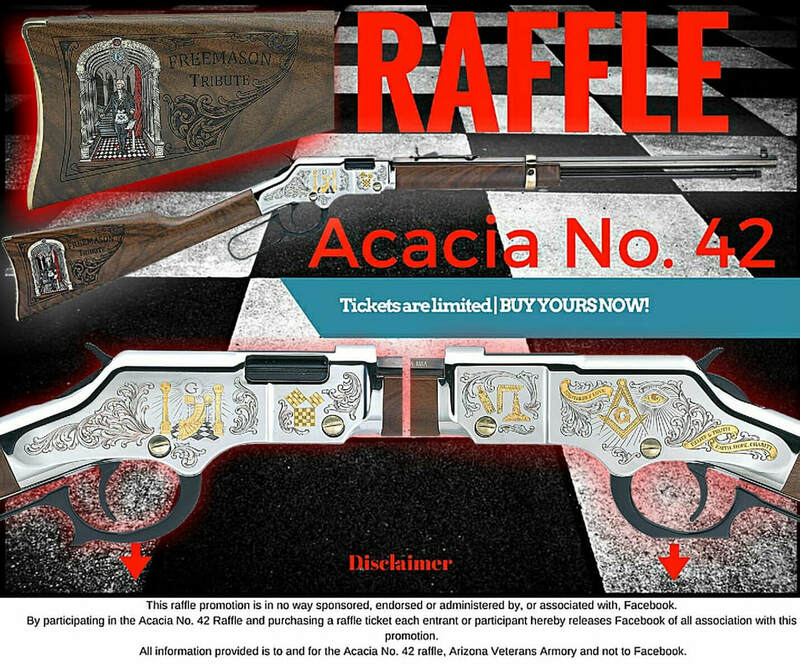 All Information provided is to and for the Acacia XLII F&AM Raffle, Arizona Veterans Armory and not Facebook. The Acacia Lodge membership pins are in and available for purchase! 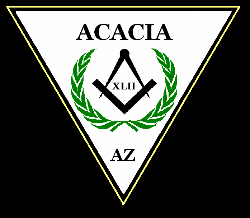 These lapel pins were made exclusively for Acacia Masonic Lodge members and widows. Designed by Bros. Shepherd, Nichols, Fontes and Mendoza this original piece is a classy way to display your affiliation. The pins are $20 each and all proceeds go to the Building Fund. To order yours contact John A. Nichols or just come down to lodge and pick one up!